Roth Underground Stations have the same specifications as standard transfer stations but are designed for use in underground or between floor applications. The unique Roth pump design delivers specified pressure at 1750 RPM without using large diameter pump casings or special piping inside the sump. These units will deliver hot water at temperatures up to 200°F (93°C) and will not vapor bind at 210°F (98°C). 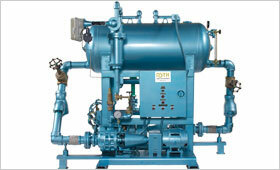 Receiver capacities to 130 gallons (492 liters) can be supplied on these units. Receivers are cylindrical with relatively small diameters, allowing easy moving through construction sites and easy installation. Roth 212°F (100°C) Underground Stations are designed to handle water near or at the boiling point. Low 1 foot (0.3 m) NPSH submerged pumps provide full capacity at any liquid temperature up to 212°F (100°C). These units will deliver hot water at temperatures up to 212°F (100°C) and will not vapor bind at 212°F (100°C). Discharge pressures of up to 75 psig (5.10 bar) can be achieved with these underground units. Stainless steel receivers have capacities up to 320 gallons (1211 liters). This Roth underground unit is ideal for handling multiple source condensate returning at various temperature levels above and below the boiling point and where sub floor returns are essential to the structural design. These units eliminate the need for several local condensate stations to handle returns from various absorbers, kettles, hot presses, molds or unit heaters condensing at different temperatures.